Steve Mekkes of Hibbing plays Jesus in the musical drama presented by Chisholm Baptist Church with performances on Wednesday-Friday, April 17-19 at 7 p.m. each day. Submitted photo. CHISHOLM – The musical drama “For Such a One as This” is once again being presented at Chisholm Baptist Church during the Easter season. Performances will be Wednesday, Thursday and Friday, April 17-19 at 7 p.m. each evening. 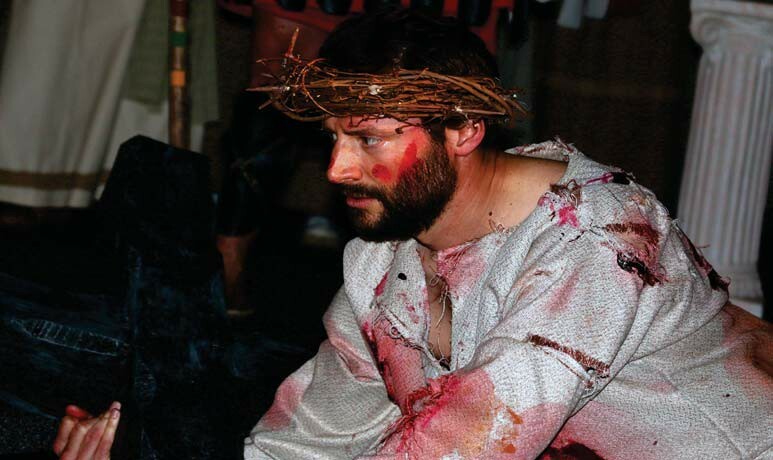 The drama presents the story of Jesus’ death and resurrection from the perspectives of his disciples and others who encountered him during that time. A variety of choral selections are also used in the production which highlight the deep impact Jesus had on the lives of those who knew him. This is the fourth time the church has done this particular musical drama. Each year there have been a few cast changes and adaptations in the script. “We believe our production this year tells the story in a fresh and even more powerful way,” Stolhammer said. One change made to the script last year was the addition of the disciple Thomas to the story. Rev. Dan Erickson, the church’s senior pastor plays that role. Erickson thinks this enhances the production. “Many people today can relate to Thomas’ doubts about the resurrection of Jesus, doubts that were answered when he encountered the risen Lord,” he said. After being “just part of the audience” for numerous years, Erickson enjoys being part of the cast. “Memorizing lines is not as easy for me as it was a few years ago, but I love working with the wonderful people who are part of this production,” he said. The public is cordially invited to attend the performances. There is no admission fee, but donations are accepted for the Chisholm Ministerial’s “Fuel for Friends” program. Those who desire to have nursery care for young children for the evening can make reservations by calling the church at 218-254-3007. Chisholm Baptist Church is located right behind the Iron Man statue at 5001 County Hwy. 5 in Chisholm. Article submitted by Chisholm Baptist Church.